12Vdc powered, 20 minute to 2.5 hour adjustable cyclic (repeating ON-OFF-ON-OFF) timer board module with relay output allowing switching of any load up to 230Vac, 5A. Ideal for use in automation circuits, flashing or traffic lights, models, outdoor / indoor (hydroponics) crop growing, etc. The time switch actives the relay for the user-set ON time. Once this time period has elapsed, the relay with turn off for the user-set OFF time. This process will then be repeated with the relay turning on and off for the same time periods. 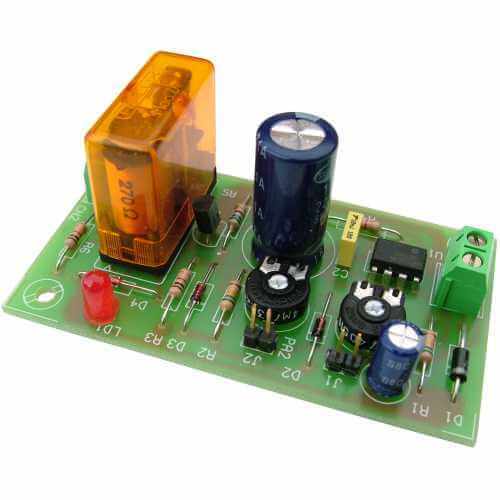 The board has two independent circuits that are used to control the ON and OFF periods. ON/OFF times can be independently set using two onboard trimmers between the times stated in the table below. The relay output is activated on power supply connection i.e. ON-OFF-ON, etc. The relay output offers NO, NC, C connection options (see Relay FAQ for details). Mains powered versions of these boards (Order Codes CI110, CI111 & CI112) and 12Vdc precision versions with more flexibility (Order Code CI217 & CI218) are available.